The modules had videos and written instructions, which made it easy to understand exactly what to do. This was my first shirt and it made a real difference having a video to follow and to be able to re-watch the parts that I found tricky. 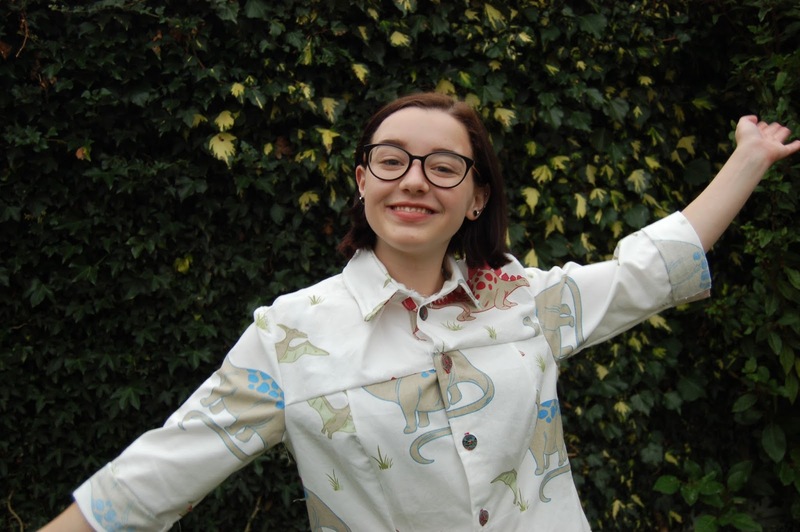 Tilly’s explanations were very clear and made it a simple pattern to follow for a shirt novice – especially with the collar, which I was a little apprehensive about, but no unpicking was needed! Pattern matching (as you’ll see from the photos) did NOT go well, it was my first ever attempt – I probably would’ve done a bit better if I’d read/ watched a bit more about how to do it, I was just too excited so I jumped right in! As a result though, I’ve ended up with a lot of headless dinosaurs. The pattern of the Rosa shirt was lovely to work with, I was a bit worried about whether I’d be able to pick the right size because of how fitted the shirt is meant to be, but of course the workshop answered that with a whole module on making sure you got the right size! It was my first time sewing proper princess seams as well, but I found that as long as I went slow with the machine and followed the seam allowance it was totally fine. The collar as well was so, so simple with the video – I watched it about 5 times just to make extra sure I knew what I was doing, but I understood it perfectly just from the first time I watched it! It was really handy to be able to pause as I went along with the steps, just to make sure I got it right. Here are my photos – the fabric (which comes with all dinosaurs having heads) is from Laura Ashley. I got it in a half price sale, so for £10 a metre – bargain!